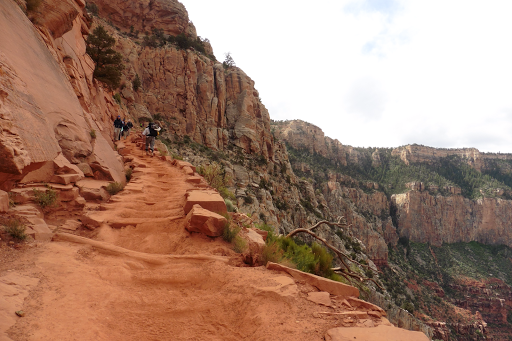 Today was the big hike up the S Kaibab Trail. 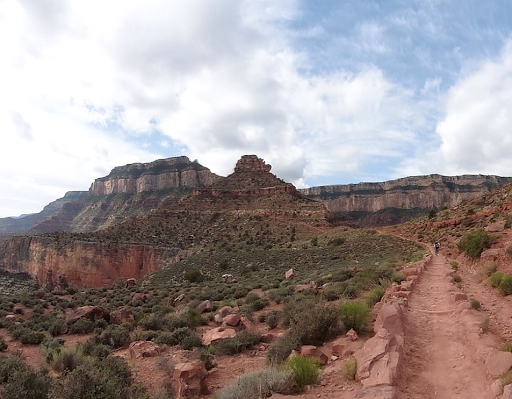 One of the two main “corridor” trails used to hike between the top rim and the Colorado River. Our camp was already a good 1,000ft up off the river, but we still needed to hike about 4,000ft more to reach the South Rim to end this leg. We got started at 6:30am, hoping to avoid major heat and had five miles to still do on the Tonto Trail to get to the intersection with the S Kaibab Trail. It wasn’t as level as the rest of the Tonto Trail, but was still smooth sailing as it curved higher. We hardly saw anyone and oddly saw Cascadia footprints, which probably belonged to Katherine, who we assumed was a day ahead of us and had reached the South Rim yesterday. The mystery would soon we solved…the clouds gathered quite ominously and quickly this morning and a sharp cold breeze kicked in. We were excited to have cool weather and shade for this climb, and again, couldn’t believe our luck with the temperatures! 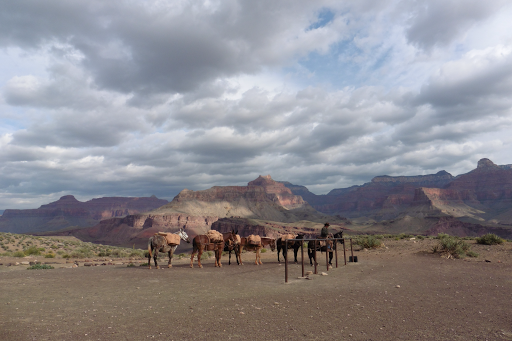 At the intersection with the highly used S Kaibab Trail, we saw many people rushing down the trail to do the “rim to river” or “rim to rim” or “rim to rim to rim.” There was even a train of donkeys that came down the trail with supplies. It seemed that in a 20 minute period, we went from seeing no one to seeing more people than we’d seen over the entire past week! 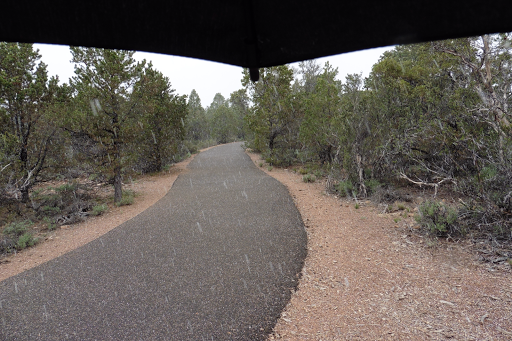 The day hikers we spoke to told us there is a 60% chance for thunderstorms and possibly snow up on the rim. They also confirmed that Katherine was about an hour ahead of us and we were surprised since two days ago, someone saw her camped at a site that would have set her up to easily make it to town yesterday. 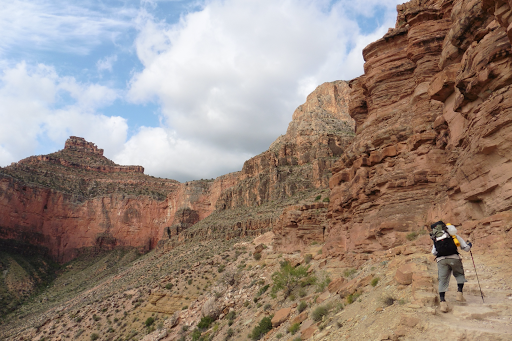 We continued up the 4.6mi S Kaibab Tr climb and about 3,200ft elevation gain. It was well graded for horses and not as steep as we had anticipated. We flew up it fairly quickly with the cooler weather and brisk winds kicking in. It only took us two hours to do those miles, and it was good that we did it quickly since the weather changed soon after…the view were great! 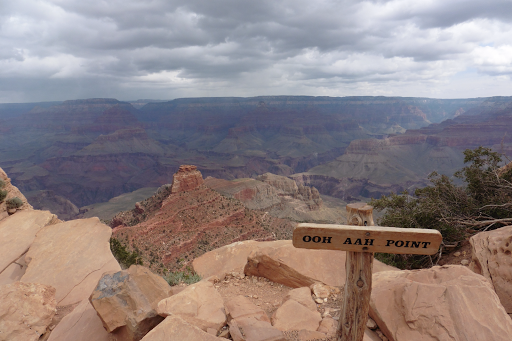 This one cracks me up… Ooh Aah Point! Once at the top of the rim, I wanted to do the 5 miles across the village to the trailhead we’d be leaving from after our zero so that I wouldn’t have to walk it with a full pack walking out of town. Gavin isn’t as concerned with connecting footsteps, so I walked it on my own…as soon as I started walking, it started to SNOW! It came down pretty thick and I did my best to capture it. It was cold up there too. This trail is so all over the place! As I walked, I got the most amazing service on my phone that I’ve had all trail and I was able to multitask and get some things done. I got ahold of Katherine and she did slow down her last two days and do basically half days of hiking to stay on her permit and relax, so we are overlapping in town unexpectedly. She will probably be taking a different route than us leaving the S Rim since she has really enjoyed the solo time and not seeing other hikers for the end of the trip. I’ve mentioned that I’m using Li Brannfors’ maps and tracks for this trail. He lives and works here in the Grand Canyon and we had all arranged to meet one another while in the village. I have mentioned before that I have mad respect for this man and all the efforts he puts into his maps. He voluntarily makes free and great detailed maps and alternates for this trail, the GDT, the GET, and at one time, the AZT. Katherine has been track logging the trail for Li and waypointing significant points, like water, along the way to improve on them even more. Li was kind enough to accept my resupply packages, shuttle us around if needed, and offered to host us in his small residence space in the village. Gavin and I decided to go with a more spacious (and wifi included!) 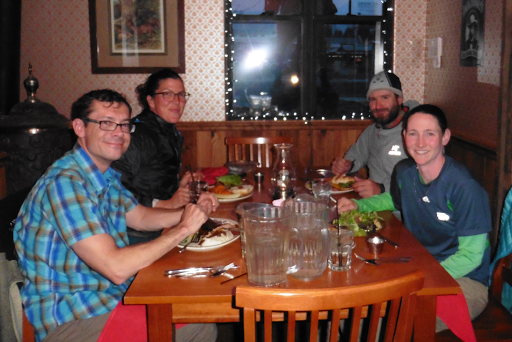 hotel for our zero tomorrow, but we were all able to have dinner together and that was fun. Li even gave me his laptop for the night and much of the day tomorrow! He’s making us all dinner tomorrow night and is a wonderful host. THANK YOU LI for all you do for us hikers!!! Such a great community. So tomorrow is a zero…I feel like I just took a zero, but it is nice after such a long leg and the next leg should be a 10 day leg with some of the most strenuous hiking of any leg so far thrown in. I’m excited to rest up for a day and hopefully catch up on those few Greys Anatomy episodes I still have yet to watch! Oh, a side note…Gavin found his camera today!…In his first aid bag! Close call, whew!